Rooms have been pre-booked at the hotels listed below and you will book directly with the hotel that would like to stay at. To take advantage of the conference’s own hotel prices, state the booking code that is presented by each hotel below when you book via e-mail or telephone. Payment is made directly to the hotel using credit card or cash. All prices are inclusive of VAT and breakfast. To cancel your hotel reservation, please check the hotels’s cancellation policy and contact the hotel in writing. Less expensive alternatives such as dorm rooms or rooms with shared bathrooms. 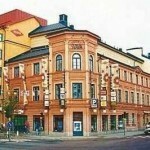 Uppsala City Hostel, around 250 SEK per night for dorm rooms or around 500 SEK per night for rooms with shared bathrooms. Very central in town. Hotell Centralstation, around 250 SEK per night for dorm rooms or around 500 SEK per night for rooms with shared bathrooms. Here there are also regular en suite rooms for around 750 SEK. Located right next to the station. Uppsala CityStay Hotel, around 250 SEK per night for dorm rooms or around 600 SEK per night for rooms with shared bathrooms. There are also regular en suite rooms here for around 1000 SEK per night. Located right next to the cathedral. Located about 40 minutes by train away from Uppsala. All of the following hostels are very close to the Stockholm Central Station. Hostels by Nordic, around 200 SEK per night for a bed in a dorm room. Interhostel, around 200 SEK per night for a bed in a dorm room, or around 500 SEK for a room with a shared bathroom. City Lodge Hostel, around 250 SEK per night for a bed in a dorm room, or around 600 SEK per night for single rooms. Note that these prices specifically exclude bedding. Birka Hostel, around 250 SEK per night for a bed in a dorm room, or around 550 SEK for a room with ensuite toilet and shared showers. City Hotel, around 250 SEK per night for a bed in a dorm room, or around 500 SEK for a room with shared bathroom.